Capitoline Properties was formed to take advantage of mid-market investment opportunities that are too large for traditional mom and pop investors, however, not large enough to be on the radar of large institutional investors. Within this niche, we are focused on expanding our portoflio in Central and Southern California and Bozeman, Montana. Capitoline Properties is committed to providing our residents with the utmost quality of living and highest level of service. We take pride in the personal relationships we develop with residents while simultaneously delivering consistent bottom line results. Our investment strategy is to minimize risk and achieve superior returns by focusing on properties generating strong cash flows and adding value through renovations, re-tenanting and expert property management. 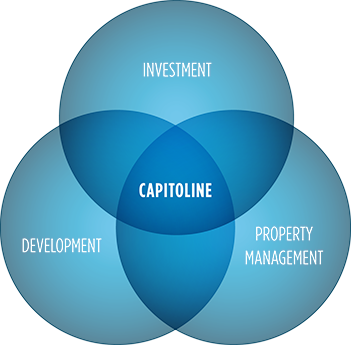 Capitoline Properties provides our investors with three distinct services: Investment, Development and Property Management. Investment Services are managed by Luke Tracy and Jared Filippone. In this capacity, Luke and Jared are responsible for the sourcing, due diligence and closing of all acquisitions; negotiating and securing financing, and long-term portfolio management. Currently, the firm is focusing its investment efforts in Central and Southern California and Bozeman, Montana. Development Services are managed by Luke Tracy, JoEllen Casperson and Jared Filippone. Along with our close relationship with our general contractors and architects, Luke, JoEllen and Jared manage the negotiation and closing of construction financing; construction budgeting and project cash flow projections; design review and city/county communications; and vendor sourcing, payments and relationships. Property Management Services are managed by Luke Tracy, JoEllen Casperson and Erin Timmerman. These three along with the rest of the team are responsible for the day-to-day management of all properties in our portfolio. Activities include leasing, maintenance and repairs, tenant relationships and issues; and the management of on-site personnel. The team has over 20 years in combined property management experience with the upmost level of dedication to tenants, employees and providing a quality and peaceful atmosphere for residents.